A scene for the March 24 #MarchforOurLives gathering. At first, the name “March for Our Lives Salt Lake City” made sense—it referred to the 8,000-strong crowd that chanted, yelled and trudged its way to the Capitol last March and demanded lawmakers pass bills that better protect Utahns from gun violence. But last week, after appointing a new organizing board, the local chapter of a nationwide movement that advocates for gun reform changed its name to “March for Our Lives Utah,” to show it’s committed to including the voices and representing the interests of students from across the state. “We want to make sure we aren’t just hearing voices that come from Salt Lake City,” Rowland Hall senior and March for Our Lives Utah outreach co-chair Noah Blumenthal, says. March for Our Lives is a group of young activists whose founding members are survivors of the Feb.14 massacre at a high school in Parkland, Fla. Since its inception, smaller groups have sprung up in cities and towns across the country. In the early months of a new school year, the local branch appointed a new board, since many of its original leaders graduated from high school before the summer. “The board has to change every so often because we want the organization to remain led by high school students,” Blumenthal says. Nicolas Baca, a senior at East High School and another Utah mach outreach co-chair, estimates there are eight Utah-affiliated schools within Salt Lake, and more than 30 outside city limits. “We’re getting more people to contact us about getting endorsed or starting new things,” he says. “We’ve always been made up of students from around the Utah Valley,” Blumenthal says, noting the strong participation from Provo and West Valley City students. Baca and Blumenthal say new leadership will focus on expanding its outreach in the coming year so it can represent the interests of all Utah students, not just those in the capital city, and underscore that gun violence is an issue affecting young people and adults alike, regardless of whether they live in urban or rural communities. On Tuesday, Sept. 25, local ambassadors and affiliated clubs will hold voter registration drives at high schools, where teachers, faculty, staff and eligible students will be encouraged to register so they can cast ballots in the November election. 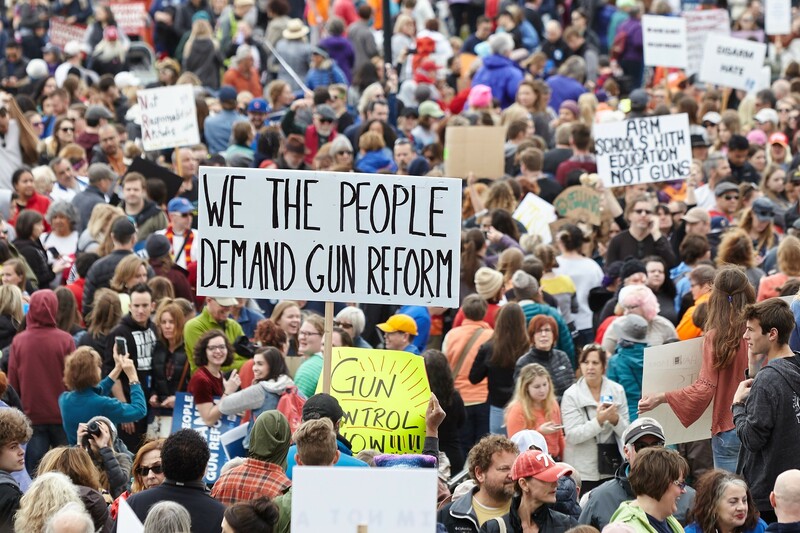 With the midterms fast approaching, Baca says Utah members are meeting with elected officials and candidates running for office, to gauge where they stand on bills and proposals related to gun reforms. “We’ve talked to candidates from all sides of the spectrum,” Baca says, from John Curtis, a Republican running to replace Jason Chaffetz, to Ben McAdams, the Democratic mayor of Salt Lake County vying to unseat Mia Love. Entering its second year under new leadership, Blumenthal says the regional chapter will work to build bridges across the state, continuing a campaign that emphasizes the intersectionality of gun violence.